For over 50 years, Dame Libby Komaiko’s extraordinary career has embodied art, education, and cultural integrity. Her passionate advocacy of culturally specific art was well known, and her devotion to higher education recognized by artists and educators throughout Chicago. Dame Komaiko started her dance training as a young girl, studying with Elisa Stigler at the Chicago Musical College of Roosevelt University. As a teen, she studied and performed jazz, modern, and musical theater with the famed Gus Giordano. By age 18, she auditioned for the legendary Jose Greco, and was given the opportunity to train and perform with his world-famous, Spanish Dance Company. 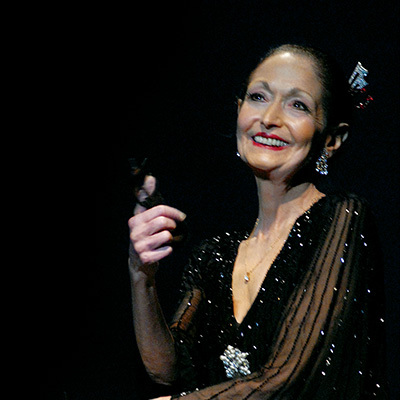 Her journey into Spanish dance led her to the company of Lola Montes, and she studied with Maria Alba, Nana Lorca, Edo, Manolo Vargas, and many others. She partnered with the late Roberto Lorca for many years. In 1975, she founded the Ensemble Español—and what began as a company of seven student dancers, is now a full company of 40 dancers, musicians, singers. She choreographed and produced the majority of the company’s choreographies, which now numbers near 135 original works. She was the recipient of many awards and civic honors, including the coveted Ruth Page Award (2003), the International Latino Cultural Center Lifetime Achievement Award (2004), and most recently, she received the first Legacy Award from Audience Architects for her commitment to the arts community. She was a professor emerita at Northeastern Illinois University, and was given the Distinguished Alumni Award by the school in 2016.